Apple’s newest revision of OSX, Snow Leopard , has been covered to death in recent days. Thus rendering any sort of detailed review redundant. So, as a launch day upgrader across a couple of Macs (one iMac, one MacBook), I thought I’d just point out some of the subtle changes I’ve not seen covered elsewhere. Repetition be damned! If you’re interested in some pre-Snow Leopard hidden gems, take a look at 5 Hidden OSX Gems, 5 More Hidden OSX Gems and 5 OSX Leopard Hidden Gems. I’m quite a keen photographer and as such find myself connecting a number of image capturing devices to my machines. It was previously very difficult to manage multiple Cameras . Yes you could control which applications were launched but this was for all devices. Now you can go a step further and control preferences on a per-device basis. To do this connect the device to your machine and launch the Image Capture application. You’ll then see a list of connected devices down the left hand side of the screen. Select your device and change the application you want to launch when it connects via the drop down that appears in the lower left of the screen. For someone who regularly connects a DSLR, scanner, point and shoot and two iPhones to a single machine, it saves an awful lot of time and frustration. Something that is worth mentioning, however, is that the general preference pane for Image Capture is now gone and per device type settings can be found in iPhoto. One of the great tricks OSX could pull was allowing you to zoom in on any part of the screen by holding down the “CTRL” key and scrolling with your mouse’s wheel (or two finger swipe up the trackpad). However, the usefulness of this was curtailed slightly by the fact that it was fixed such that the mouse pointer was always in the absolute centre of the screen. So any slight twitch of the mouse caused the entire screen to move. In Snow Leopard Apple have changed this by only moving the area zoomed in to when the mouse approached the periphery of the screen. A small change, and not really hidden, but more than welcome. I’ve touched on the services menu in previous “Hidden Gem” features because it remains inaccessible to so many. Behind that one menu item is hidden a swathe of useful functionality. In Snow Leopard, Apple has done it’s upmost to make the inbuilt services more useful by making them context sensitive. So you only see the services that are available to you at that point in time. They’ve also been grouped into easy to understand and navigate categories, like “Searching” and “Messaging”. Hopefully this will get more people exploring this often overlooked menu. You can also control the options that appear in the services menu from the Keyboard pane in System Preferences and then “Keyboard Shortcuts”. This option is also available at the bottom of the Services menu and can be used to add your own applications and automator actions. Pro-Tip: Read a lot of content every day? Combine the summarize (first mentioned here) and Add to iTunes as a Spoken Track services to condense it all on to a manageable track for loading onto your iPhone every morning. You could even automate this across RSS feeds using automator. There’s been a dictionary built into OSX for a long time, in Snow Leopard Apple have added a thesaurus as well. To trigger it you can either use the services menu to launch the dictionary and then select Thesaurus or you can use the old mainstay of COMMAND + CTRL + D and click on a word, and then select thesaurus from the drop down. Handy if you’re in a bind. It’s also worth noting that Wikipedia is also accessible through this method. I think Apple tried to sneak this one in without anyone noticing, but damn, it’s incredibly useful. 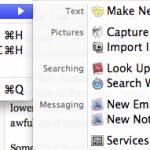 Fire up TextEdit and you’ll find a new Transformations option in the Edit menu. You can use this to change the capitalisation of your text. Upper Case, Lower Case or even Capitalised (which capitalises the first letter of every word). Very handy if you need to quickly edit a piece of text. I can’t really let this post go by without saying a few words about Snow Leopard in general. I’ve installed it on two Macs, one a new iMac and one a really old MacBook (it was bought in the first week MacBooks were available, so it’s very old). Both installations went smoothly and quickly – neither took more than an hour. I recovered between 12 and 18GB of disk space after installation (bear in mind that I had already used Xslimmer and Monolingual on both machines, so I was very surprised to regain that much). Neither machine has crashed in the week since the upgrade (although across both machines and three years of using OSX I can count the crashes in one hand) and the majority of my go to applications have been fine. The exceptions being Blogo and iStat (updates sorted both out). Printers and scanners all worked fine afterwards. All in, it’s been the least painful OS upgrade I’ve ever done, and Apple should be applauded for that. In terms of benefits, I’m experiencing fairly significant performance increases on both machines, and the new Gamma settings have made a huge difference to the display quality. The space savings are also welcome, especially on my MacBook which only has a 60GB disk. Is it worth £25/$29? For me, yes. Having the extra space on my MacBook alone is worth the entry price, everything else is a bonus (if you’re like me, and have multiple Macs, you’ll need to pick up the Snow Leopard Family Pack for £39). Have you found any hidden gems in Snow Leopard? Let us know in the comments.